Exaggerated truths have been flowering in the rhetoric following the visit of Australian politicians to ceremonies commemorating the light horse charge at Beersheba. Not a single wisp of objectivity has manifested itself in covering the proceedings, the re-enactment, and the flowing guff. Even the national broadcaster has decided to play along. Reporting on this event has often been prefaced with the sense that a regretful amnesia has set in. The Allies should be grateful to those of the Australian horsemen who rode their cause into history. That battle had been but a subset of other skirmishes and engagements between the Allied forces under the command of British General Sir Edmund Allenby and the forces of the Ottoman Empire. The aim of the Egyptian Expeditionary Force was simple and ruthless: capture Gaza, enter Palestine and knock out Imperial Germany’s ally. The Australian angle on this, aided by New Zealand enthusiasts, is equally simple. Allied efforts had stalled in the Middle Eastern campaign. An assault on October 31, 1917 as part of third Battle of Gaza had failed to make an impression. Furthermore, water was needed – desperately. Then came the assault by the 4th Light Horse Brigade at dusk. Turkish defences at Beersheba, manned by some thousand or so riflemen, nine machine guns and two aircraft, eventually capitulated. But what florid, alloyed Australian accounts often fail to note is the role of softening played by three British divisions the morning of October 31. The fall of Beersheba emboldened the British forces to break the Ottoman line near Gaza on November 7, leaving the way open into Palestine. There is nothing like a military re-enactment to thrill the jingo lurking under the flesh, readying the chests to be given a true thumping. The Israeli Prime Minister saw this as a lesson of worthy history and true character building, a fine example of Australasian prowess in the Negev Desert. It was, continued Benjamin Netanyahu, the sort of “spirit of fortitude and courage and willingness in the defence of our land and our values.” The observation is so anachronistic as to beggar belief, but such is the power of the union between patriotism and real estate, between rushed blood and disturbed soil. Australian and New Zealand forces had tasted a number of decent, murderous defeats, with these countries’ youth butchered at Gallipoli in a Winston Churchill-inspired effort to inflict defeat on the Ottoman empire. They suffered even more in the lethal trench battles of the Western front. 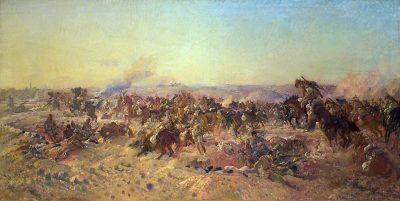 The charge of the 4th Light Horse at Beersheba a century ago, for that reason, seems a moment of ecstasy, one freed from the lethal constipation of the Western front, the inability of forces to make headway and forge victory. It was also a murderous stalemate held together by industrial slaughter, the machinery of modern war. The cavalry charge was a form of retro-warfare, an example of nostalgia on horseback and daring risk. It could well have gone so wrong, and it was drawn from the old British fantasy of previous charges, not least of all that of Lord Cardigan’s efforts in the Battle of Balaclava in October 1854 against Russian forces. Despite the slaughter inflicted upon them then, hasty glorification followed. “All in the valley of Death,” went poet laureate Alfred, Lord Tennyson, “Rode the six hundred”. Since that painful redrawing, nation states have warred, bickered and slaughtered. New states emerged, the offspring of part treachery, part opportunity, and colonial fantasy. Undertakings were ignored as the Ottoman Empire sundered. Irritable tribes were artificially captioned by fictional boundaries. Fitting, then, that the Beersheba commemorations should take place on Israeli soil.